Chickens are docile, domesticated birds common throughout Skyrim, usually within cities and towns. Attacking NPC-owned chickens will earn a bounty, but you can legally harvest eggs from their nests for use in Alchemy. 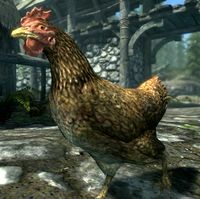 Chickens are mainly encountered in settlements without a wall, such as Riverwood. With Hearthfire installed, your steward can buy you up to three chickens for your homestead if you add an animal pen. Chickens are confusingly labeled as "rabbits" by the game data (with an editor ID of ChickenRace). The race stats were obviously copied from the rabbits race, but not fully changed. Chickens do not cluck when idle. This page was last modified on 17 December 2018, at 21:25.